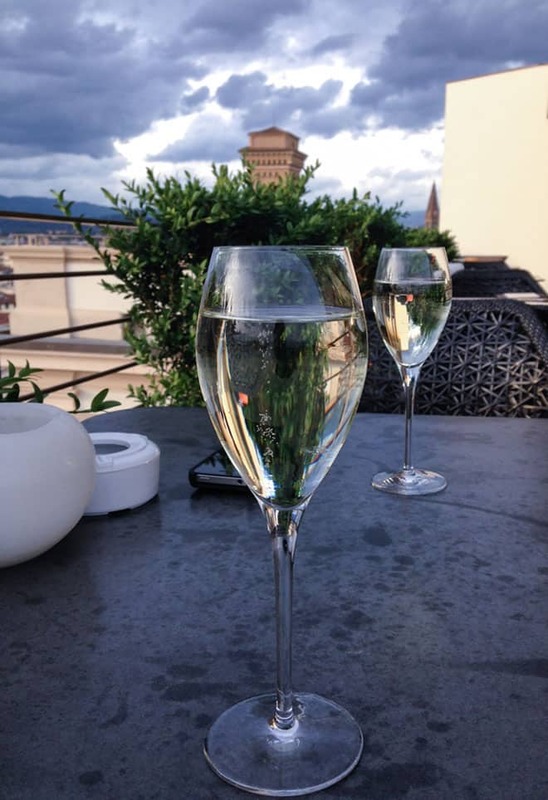 During our time in Florence we stayed at the Westin Excelsior Florence. We stayed there during our trip to Italy in 2007 and had absolutely loved the beautiful suite we had for three glorious days. 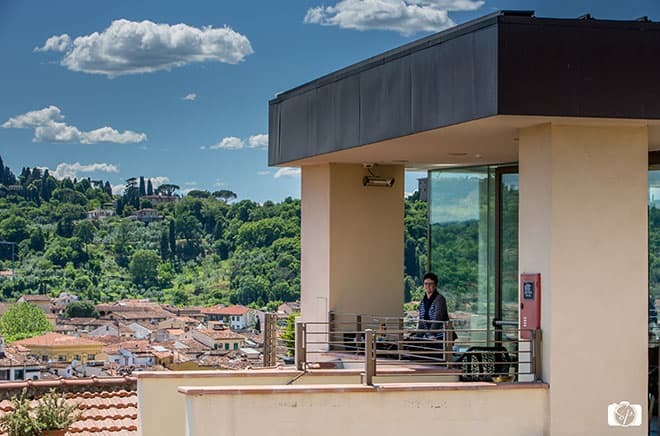 And while we didn’t have a suite this time, our room, as well as the hotel in general, is in a really great location, the rooms are amazing and the views of the Arno river are gorgeous. Since the last time we stayed they have opened up the rooftop with a bar and restaurant. It is one of the best places to see sunsets in the city and it is a popular location for tourists and locals. Our first evening after misadventures flying to Italy, we went to the roof to have a glass of champagne to celebrate our arrival. After our journey, we felt we deserved it and it was a great way to kick off our vacation! Like all apéro in Italy, drinks come with small snacks which are perfect for a pre-dinner snack! Despite the fact that it was overcast and grey, it was warm enough to enjoy the view and the clouds made it super dramatic! Over the week we went at various times to capture different sides of the roof in the various different light. We enjoyed apéro there several evenings and on our last afternoon we took a rest there as well, that is actually the perfect time to go to get photos of the city as there aren’t too many people (but do make sure you check out at least one sunset there). Mr. Misadventures had a ball trying to catch different angles from the buildings in Florence. While I held down the fort enjoying drinks! I have said it many, many times. Mr. Misadventures are long time members or Starwood Hotels SPG Program and have enjoyed nights in amazing hotels all over the world from the far corners of Moorea, to Japan, to Italy and always in Paris. Interestingly enough, the Westin Excelsior Florence is directly across the courtyard from The St. Regis. My fellow AFAR Ambassador and photographer Kirsten Alana of Aviators and a Camera stayed in both properties last November and you can see more detail photos of the Westin and the St. Regis in her post about her trip. How about you? Have you returned to hotel you really like? Do you have a favorite rooftop terrace? Beautiful! I didn’t catch views like that the whole time I was in Florence. @Katie, bummer, a good reason to go back! I’ve never done the rooftop terrace thing which makes me sad. 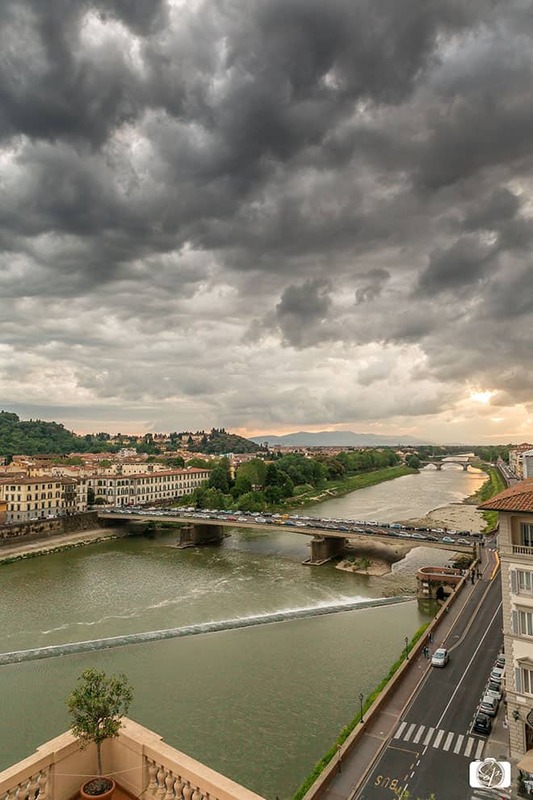 Florence looks AH-MAZING too and the perfect place for it! @Amanda, aren’t you in Sydney? They must have rooftop restaurants or bars there! @Amy, it is a great property, we walked conveniently from everywhere and enjoyed our stay immensely! We stayed there for an anniversary years ago, in either 2006 or 2007. We also had a suite, as loyal SPG Platinum members, and our suite had a balcony overlooking the river. I swear I have a very similar photo of prosecco glasses out on the balcony. @Amber, we stayed in 2007 as well and had a great suite, but not looking at the river, this time we had a view of the river, SPG rocks! That sounds like such a lovely place to stay! Florence is definitely one of those places on my bucket list that I hope to get to someday. @Robin, it is lovely and I highly recommend it if you do get to mark Florence off of your bucket list! OMG, what a view! I’ve always wanted to see Italy! If I ever get there, I’m staying at the Excelsior! @Tracy, it most definitely is – great location, great staff, great roof! The only thing more high end than that hotel is the view! What a gorgeous place! My heart literally skipped looking at the photos they are so beautiful. 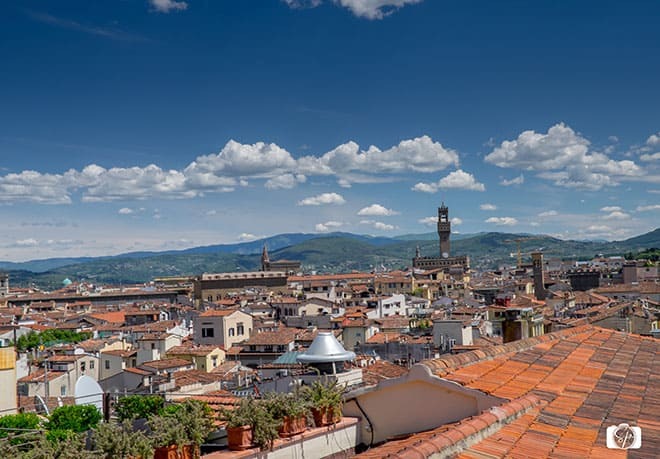 I loved, loved, loved Florence the one time I’ve been and this location and property looks amazing. I’m also a fan of Starwood properties, and not just because I can get friends and family rates 😉 That picture of you on the rooftop terrace is amazing, you need to frame it just to reflect back on that moment. It looks like bliss. @Tamara, SPG has been amazingly good to us over the years, nothing but good times! Florence holds my heart. It was my fav destination when I toured Italy. The photos you captured were absolutely breathtaking. @Cia, glad that I could help you relive fond memories! Those pictures are so beautiful! When my kids were little, we went to a hotel several times in Ocean City, MD because it was so family friendly. @Christy, that is sometimes hard to find, hotels that cater to kids and pets, when you find a good one, stick with it! Whata beautiful place and that voew is just gorgeous! We have never been there yet but hopefully someday we can. @Chubskulit, it is amazing, hope you get there too! This post is SO making me want to go to Italy! It is on my bucket list of destinations i’d like to travel to. @Winter, it is great when you feel like you are taken care of by the program that you have invested a lot of time and money in. What has been your favorite Hilton stay or memory? Hands down the Hilton in Japan! The service, amenities, and beds were incredible. @Winter, Japan is AMAZING for hotels! They really know how to make a guest feel like a king! Gosh – what a memory maker. Loving your photos and that Hotel Westin Excelsior looks like a place for us to visit to be sure! I am so want to be there! @Donna, thanks it really was very memorable! This looks like an amazing trip and so beautiful. I love to eat on the rooftop. Here in Ottawa we have a few really nice rooftop restaurants. @Ann, I didn’t think much of them before this trip, but my mind has definitely been changed! We typically stay in a certain chain of hotel. It has been a while since we have gone on vacation. I would enjoy staying in a terrace or rooftop suite. The views would be amazing. @Christy, it is good to be loyal to a particular chain, I hope it has a loyalty program so that you can take advantage of perks when you do stay. I’ve gone to a hotel a few times and will keep going back! When I like one I enjoy and keep going back. No roof. Tip terrace though. This looks lovely! @Jeanine, I am the same way, there is always a need to replicate good times! What an amazingly gorgeous view!! I haven’t been to a rooftop terrace mainly because of my fear of heights but I think the glass of wine you had might help to quell my fears just so I could take in that view. @Nicole, ha-ha I hear ya! If it is any consolation, the building isn’t very tall! Wow! What a beautiful place to stay. I really love those photos. I have never stayed at a place that looked that nice. Thanks for sharing your experience. @Bonnie, it is beautiful, hope you get to stay in an equally beautiful hotel in the future! Oh my goodness, the Westin Excelsior in Florence is absolutely gorgeous! I love the photos that you took! @Carly, thanks, glad they could inspire you! What an amazing view and experience! I have always wanted to travel, this is definitely on my bucket list now. 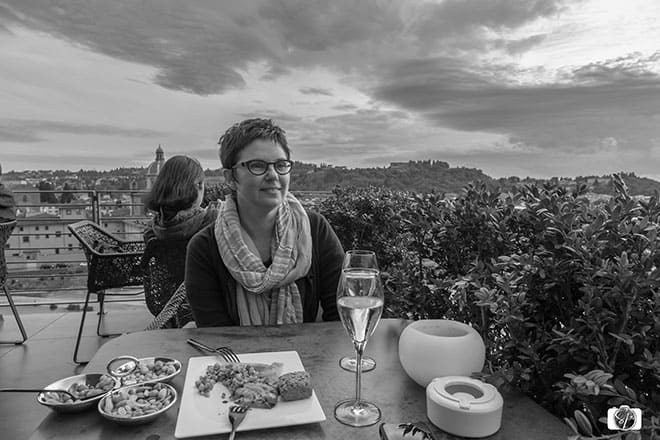 @Jessica, it is a good choice, Florence is a wonderful place to visit – art, music, history, food, something for everyone! WOW! What an absolutely gorgeous view. I’ve never been on a rooftop terrace before but your post makes me realize I need to! What an incredible view! This looks like it would be a wonderful place to stay!! @Michelle, it is, tons of history, great location, awesome roof! The views are undeniably gorgeous. Visiting Florence is on my dream vacation list. I hope we get to visit it someday. @Lynndee, I hope you get there as well, it is such an amazing city! @Miranda, an excellent choice, the city has so much to offer! Wow! What a gorgeous view of sch an iconic city. 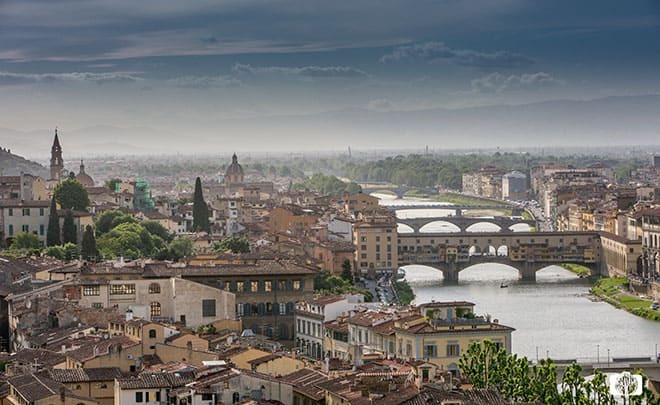 I have never been to Florence but would absolutely love to go. @Kelly, it is a great walking city and the people are incredibly friendly! I love The Westin in general and the one in Florence is just gorgeous!!! I will make it there one day!! @Ricci, I agree, I have stayed in some amazing Westins. Wow, the view from your room was amazing! I would have been tempted to stay in, drink wine and admire the view. @Paula, oh we did that at least one night! How could we resist? That is amazing and honestly, loving the rain like I do, I would have loved the grey and overcast weather! @Sharon, you and me both, I love the rain so it didn’t bother me! I would LOVE to stay in this hotel in Florence. I love Starwood properties. My stepmom used to work for them, so we stayed at a few and of course loved every one of them. @Jenna, I have stayed in some amazing properties over the decades, they are the best loyalty program out there in my opinion! @Courtney, keep it on that list, you must go there some day! It looks like you had an amazing time. The views are just gorgeous. I have never stayed in a hotel like this but maybe some day I can. Thanks for sharing these gorgeous pictures. @Rebecca, thanks, it is a magical place and I feel blessed to have been able to experience it! jacob’s been a long time member of hilton since he always stayed with HH during business trips, while i definitely prefer SPG. 🙂 these are such pretty views of florence. We need to make it out to that side of Italy one day. @Esther, for sure! Florence is so wonderful and such a walking town!